You can control which conversations show up in the Select list by opening (Ctrl-O) and closing them from the Conversation menu. If you need to get back to a closed conversation, you can open it again. 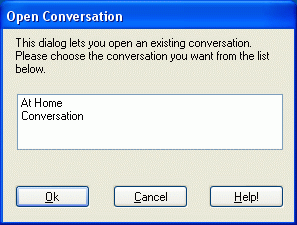 To open a conversation from this dialog, select it with the mouse or keyboard, then press Enter or click on OK. Click Cancel to skip opening a conversation.